Rafael Lozano-Hemmer - Project "Sway"
"Sway" is a kinetic sculpture that responds to data; it is a computer-controlled metronome that oscillates to the rhythm of a specific statistic. 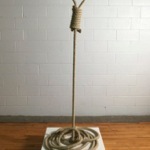 The rope was braided onto a thin vertical steel rod to make it stand upright and the floor rope acts as a free-standing base. 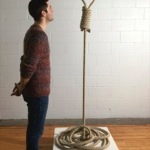 The piece stands on a wooden plinth which contains a small motor and an electrical circuit that makes the noose sway and pendulate almost imperceptibly from time to time. 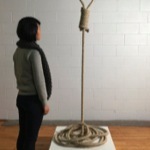 The sway adds to the trompe l’oeil effect of the rope hanging upside-down. 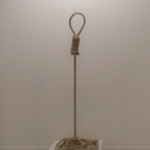 The collector or curator may choose the frequency with which the rope sways, with the default value being around once every 40 to 60 seconds, which represents the rate of homicides in the World. 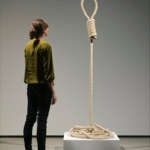 Other possible numbers include the rate of suicides, one every 30 to 50 seconds, the rate of drug-war related murders, one every 25 to 35 minutes, or the rate of journalists killed, one every couple of days. 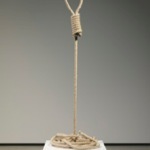 There are many artists who have worked with the noose throughout Art History, but there is one precedent to this work that is essential to reference: unbeknownst to Lozano-Hemmer, artist Fermín Ceballos made an upside-down noose for his exhibition "Perturbación" in the Centro Cultural de España in Santo Domingo, Dominican Republic, in 2012. 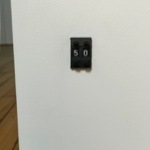 For more on his work please visit his page. Keywords: indoor, robotic, generator, statistics. Bienal de Cuenca, Casa Bienal, Cuenca, Ecuador, 2016 - 2017. 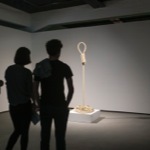 ARCO '16, Art Bärtschi & Cie, Madrid, Spain, 2016.